The animal lovers among us will more than likely have fond memories of being allowed a pet as a child. The excitement, the unconditional love and a natural, cuddly playmate! In fact, some of our fondest memories of our childhood maybe our memories of our first furbabies. Without really even knowing, our pets give us a lot and teach us a lot, so when we’re around animals from a young age, they can teach us so much at this tender age, about love, kindness, respect and taking care and thinking of something else’s well being rather than our own all the time. So, as the following 20 pics will prove, if you’re a parent and your child is mercilessly and constantly asking you for a pet of their own, we urge you to strongly consider it! The gains from it (for the child AND YOU), may be way more than you ever bargained for! 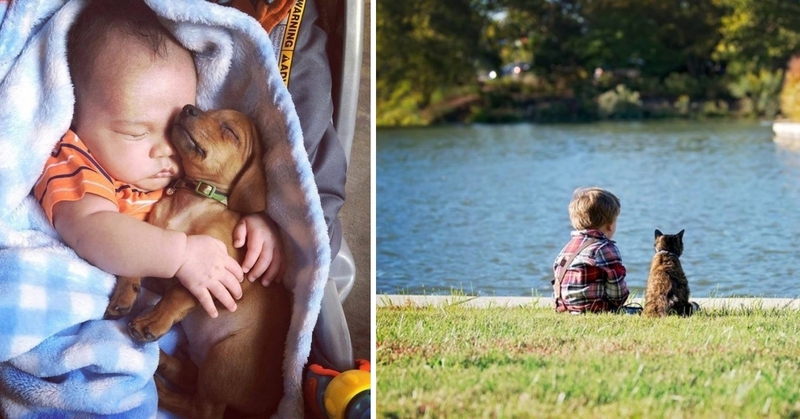 There’s nothing quite like witnessing the special bond between a kid and their pet, but that bond is especially more beautiful when there’s a Dog involved. Dog’s have this natural way of showing love to everyone around them (regardless of who they are! ), which is such a valuable lesson to pass onto its human friend. Every kid deserves a dog and every dog deserves a kid. Bless! 2. They’ll always have a nap buddy! Getting a pet for your child will always ensure that they have a nap buddy when the need arises…they’ll also be well protected and kept warm by their fuzzy best friend. Now, you can’t ask for much more than that, can you? As someone who grew up with some of the best felines on the planet, I know that there’s no more of a perfect day in your childhood, then lounging around and playing in the garden, in summer, with your best cat. I’m sorry, I think my heart just fell out onto the floor…I’m just going to go and cry now. The more puppies, the more warm, smelly noses and feet that you get to cuddle up to! It’s a win-win situation! 5. But it’s not all about cats and dogs…! Their favourite, furry best friend can come in all shapes and sizes! As this gorgeous picture proves! No matter what happens, a kid will always have a best friend in their pet. They’ll be there for them when no other person is. 8. Tough on the outside, sweet as sugar on the inside! Anyone who discriminates against ANY breed of dog should look at this picture. As with your kids, if you raise them right, you’ll have no problem! Animals are so clever and have natural healing abilities, they have a natural way of being able to help so many people with disabilities live a more normal and safe life. Seeing your children witness these acts of selfless behaviour at a young age, will hopefully help them to follow suit as they get older! I think this is so sweet how the little boy has given in and let his feline friend have the pillow. He obviously didn’t want to move kitty…he’s totally a mad cat dad in the making! He’s already showing one of the most concrete signs…NEVER MOVE KITTY. 13. Don’t worry Mom, you need a break! Anything for this doggo’s little princess! 16. Can you see it? OVER THERE! LOOK! If we hadn’t established already that a child’s dog will be with them through everything, good and bad, then this photo certainly has. I think I may need to go and cry again! This family’s new babysitter has obviously overdone herself on her nanny duties already, oh well, sleep tight gentle doggo, we’re sure you’ll make up for it tomorrow! 19. Don’t go near my hooman while he’s sleeping! Or you will face the wrath of DAD DOGGO!!! 20. Partners in crime 4ever! This beautiful pic, just screams ‘mischief makers for life!’ They’re such a sweet pair! We can tell that those two are probably causing chaos, breaking hearts and making memories for life on a daily basis.